A suite of tools supporting strategic and tactical nutrient management planning. Password protected accounts for managing multiple projects. 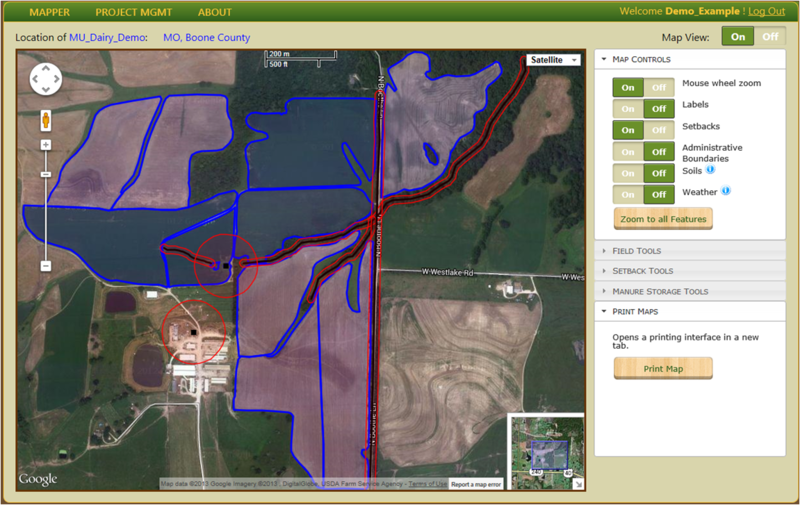 Feature delineation including fields, application setbacks and other farm features. Map creation as needed for nutrient management plans. Collected data exports to other programs including Purdue Universities Manure Management Planner (MMP). Exports can include shape files for use in GIS programs and supporting layers provided by the Missouri Clipper. Current capabilities of NMTracker replace Missouri’s Spatial Nutrient Management Planner (SNMP). We are working to expand the capabilities of NMTracker. Please click on the About and News menu tabs for usage and contact information. This project was made possible, in part, by support from USDA-NRCS. Copyright © 2014 — Curators of the University of Missouri. All rights reserved. DMCA and other copyright information. Please note that most buttons have hover info attached to them that may help you. Move your mouse over a button and keep it still for a second to see this additional info. For problems, questions or comments, contact Kevin Atherton (programmer) or John Lory (project manager) at the University of Missouri. You are on version 1.0.0 of NMTracker. NMTracker uses MMP 0.34 for calculations and downloads. The "MAPPING" tab allows you to draw and edit features on your map. The "NUTRIENT MGMT" tab allows you to enter and edit nutrient information such as soil and manure tests.